CNG: Printed Auction CNG 75. HUNNIC TRIBES, Nezak Huns. Sahi Tigin. Circa 710-720. Æ Obol (1.39 g, 9h). Sale: CNG 75, Lot: 763. Estimate $200. HUNNIC TRIBES, Nezak Huns. Sahi Tigin. Circa 710-720. Æ Obol (1.39 g, 9h). 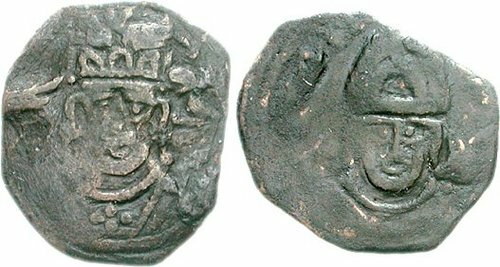 Crowned facing bust in the style of Sasanian king Khosrau II / Facing bust of Anahit in flame nimbus. Göbl, Dokumente Em. 216A. VF, black-green patina, areas of flat strike. Rare.